Announcer: Welcome to the Cognified Marketing and Selling Podcast, where we share interviews, stories, strategies and even a few rants with doctors, marketers and sales reps that are in the trenches — people just like you. We’ll explore ideas, discuss new technologies and learn how to market and sell smarter. Now, from Minneapolis, Minnesota, here’s your host, Joel Gaslin. Joel Gaslin: Hey, everybody. 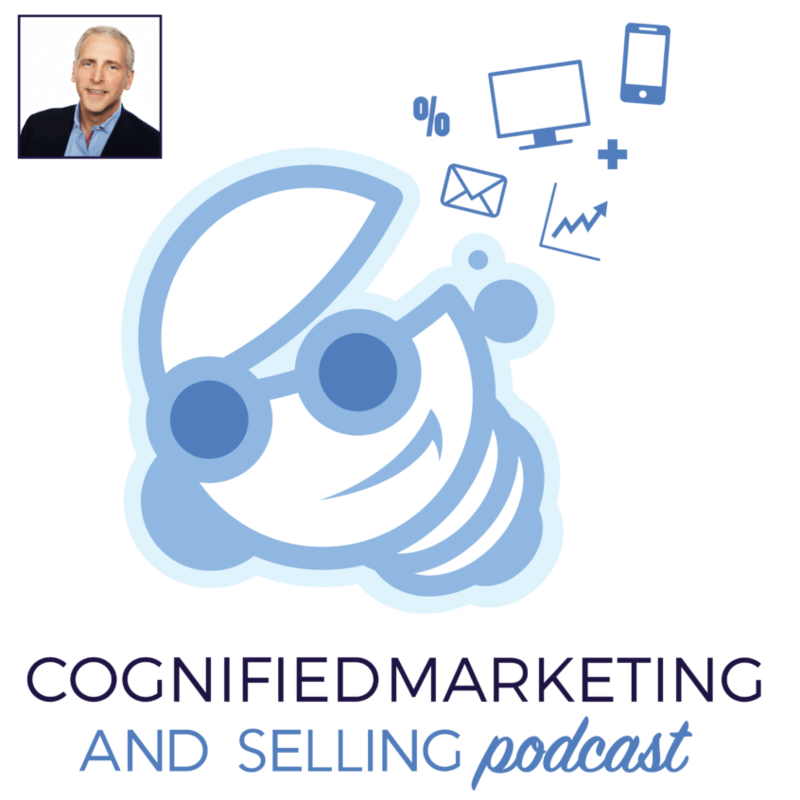 Welcome to episode number one of the Cognified Marketing and Selling Podcast, what I hope will become your go-to source for selling and marketing tools, tips, strategies, stories and even the occasional rant. Since this is the maiden voyage of the podcast and my first time doing one as a host, please know that I’m grateful you are here and humbled you will take a chance on listening to my work. Today’s episode will be a little different than what I aim to produce in the future because I believe I owe you the answer to three questions. If I were you and listening to your podcast, I’d want these answered before I’d ever consider listening to another episode of the show. The three questions you’ll get answered today in this episode are why listen to the podcast, what’s with the name cognified, and who am I to deliver this podcast and why now? That’s four questions, but three and four are linked. It’s my show, and now you get a sense of how this whole thing’s going to go. My promise to you is this. Today’s show is the only podcast episode that will be focused on me. What I’m trying to do here by telling you a bit of my story is credential myself and give you a reason to think about growing with me on this project, because that’s what this is — a project, labor of love, whatever you want to call it. Enough about that. Let’s get started. Have you ever looked at your cell phone and, if you’re of a certain age, wondered how it is so much smarter, smaller and useful than the old one you used to lug around? It’s OK if you haven’t. I have pondered this question, researched it a bit, and believe that the foundation of the improvement in this technology is in its software and how it makes the device run. Like so many things in my life, this question led me to another question along the lines of a book I used to read to my kids when they were little called “If You Give a Mouse a Cookie” he’s going to want a glass of milk. The question, or quest, depending with whom you speak, especially if it’s my wife, Jean, for me became what is happening in the selling and marketing world that is like this — one thing just leads to another. It turns out a lot. This podcast will teach you about selling and marketing through research, interviews, stories and occasional rants from everyday people who are working to get something done, myself included. Will they be famous people, you ask. I don’t know. Depends a little bit on your definition of famous. My definition is anyone who is making good progress on a goal they have set for themselves, maybe gets knocked down, gets up to do it all over again with a new strategy or tactic and finally succeeds. If you’re as interested as I am in talking about stuff like this, hang on, because it’s going to be a fun ride. I want to learn about how these people are doing what they’re doing, share it with you, and add whatever value I can to the idea, story, tool, or strategy. Back to the original thought about the cell phone. Most things today utilize some form of object-oriented program to operate because it’s efficient, flexible and powerful. It’s also powering Internet-based software and driving the Internet of Things revolution. The basics of the software lie in featuring classes of objects that utilize different methods to create some output. That’s my simple definition anyway, and I’m sure someone with much more knowledge than me can go on an interesting rant about OOP and why it’s better than the structured or procedural code that is so quickly beaten. As a nod towards what’s to come, I hope to one-day interview someone who can do this for us in an engaging way. Who knows, maybe I can get Matt Weisfeld to come on the show. I liked it because it captured, in a native sense, what I was thinking about for the future of selling and marketing for 2016 and beyond. Cue the Buzz Lightyear jokes. Object Oriented Marketing and Selling is not, however, super-catchy. More about where cognified came from, some expansion on this notion of marketing and selling and software in a little bit. If you’re at all like me, you’ve listened to different podcasts and audio books, and perhaps you wonder what is different about this one, and what will I get out of listening to it? That’s a great question, and my answer is, it depends. It depends on what you are looking for and what you are willing to put into it. That sounds a little preachy, and I don’t want to be that way, but it’s true. My goal is that if you, at some point in the podcast, hear something and think, I haven’t thought of it that way or thought of doing it that way. By having that thought, you’ve helped me accomplish what I’ve set out to do with the Cognified Marketing and Selling Podcast, and I’m grateful for that. More importantly, if I can interview someone, offer an opinion, or share some research that helps you have this thought you win, because, in my experience, thinking like this will change your business and your life. We must come to new conclusions and derive novel solutions to our opportunities in our lives if we want to achieve our own definitions of success, and how you think about success doesn’t matter. This notion of an aha moment remains my attainable goal. I started listening to podcasts a few years ago when a guy on our board of directors who’s an ultra-marathoner told me he listens to podcasts on these ridiculously long runs he’d talk about. After that, I tried a few different ones, and, like so many things, some were good and some not so much. I found that I liked mostly business-related feeds, because that’s where my career and hobbies come together, weird as that may seem, and I also know there are podcasts available on pretty much any topic you may be interested in. I do like that variety if I want some kind of diversion on one of those low motivation days we all have. Where I lose interest in podcasts is when the episodes are crammed with advertisements and self-promotional materials and then they interview people who have vast financial resources and a staff to write about content and edit episodes. I do understand that most of these people have worked hard and produced good work that helped them get to where they have the platform on which they now stand. I wholeheartedly congratulate them on their success and hope to one day join them. Since I’m just getting started with my podcast, have no subscribers and nothing more than a desire to produce good content, perhaps one day I’ll understand the dilemma some of the big guys and gals face. For right now, though, we have no ads and no sponsors, and that’s not passive-aggressive begging for money. It’s simply a statement of the way things are today and evidence of a willingness to evolve as long as the content stays valuable. Even after that mini-rant, please know that I am grateful for the opportunity to produce this podcast all on my own today. It’s a little clunky, and I know I’ll get better over time, because that’s what happens when you commit to something, practice and, in the words of Seth Godin, ship. My promise to you, the listener, is that the Cognified Marketing and Selling Podcast will provide thought-provoking and actionable content with research and interviews focused on the subjects of physician marketing, corporate or B2B marketing, and selling in a territory. All of these subjects are near and dear to my heart and are the areas where I earn a living to feed my family today. You’ll hear from people who are practicing what they’re talking about. I’ll tell you more in a few minutes about why I’m qualified to talk about ideas, share stories, and interview people, getting it done in the trenches within these exciting areas of business. What the heck is cognified, anyway? Good questions. As of right now, it’s a nothing word. The Urban Dictionary says cognified is the moment right before a thought occurs, like the aha moment I referenced earlier. We’ve all had those moments at some time in our lives. As I said, it’s new, so will you join me in putting cognified in the business language? Here’s your chance to be on the forefront of one of those business buzz phrases like, “At the end of the day,” or, “The overarching theme,” or, my personal favorite, “Journey.” That’s enough about that. I believe you get the idea. I came up with cognified while I was reading the excellent new book by Kevin Kelly called “The Inevitable — Understanding the 12 Technological Forces That Will Shape Our Future.” In this book, the second force Kelly writes about is cognified. If you’ve ever had a book passage that hits you like a ton of bricks, that’s what happened to me with the first paragraph. Here’s what it says, “It is hard to imagine anything that would change everything as much as cheap, powerful, ubiquitous artificial intelligence. Think about that. That’s pretty powerful. After reading that part, I devoured the rest of his book and bought up all of the URLs I could around cognified. As an aside, I’m a bit of a URL hoarder and the hope is that one day I can monetize that little quirk, but we’ll see. Why am I the guy to create the Cognified Marketing and Selling Podcast? What I am obsessed with is that I think the concept of cognifying aspects of our work and lives so that we live in a cognified age is an exhilarating possibility. To add smarts to our marketing and selling processes may be just that little change that leads to a monumental improvement in outcomes. Wouldn’t that be great? Prior to reading Kelly’s book, as I talked about a little earlier, I was doing some thinking, reading, and research to increase my understanding of a type of software development called object-oriented programming — OOP. What made me start thinking about this was a desire to help the marketing and selling teams at Sightpath Medical, where I currently serve as the EVP of sales and marketing, to improve their results. While doing this, I came across an interesting book by Matt Weisfeld called “The Object-Oriented Thought Process.” I was interested in this book for the same reason that OOP is prevalent in so much of the software that touches our lives today. I was searching for improvement in resource usage and output. OOP is the poster child for efficiency and output improvement. Stay with me here. I know we’re talking software, but they’re teaching programming now to kids in elementary school, so I don’t feel like it’s too much of a stretch. OOP is a method of software development that features objects and uses encapsulation, inheritance, polymorphism, and composition. I was struck by the utility of these concepts and how they might apply to marketing and selling. These are some unfamiliar concepts to most of us, for sure, especially when applied to selling and marketing. Just know that we’ll teach a lot more about these ideas and how they apply as I roll out more episodes of the podcast and, ultimately, the book. I guess maybe I should keep this analogy a bit of a secret, but I haven’t seen anyone else writing about marketing and selling in this way, and I want to share it. I think it works. We always told our kids when they were little to share, to it’s good for me to practice what I preach. How does this apply to physician marketing, you ask? Great question. I’m privileged, over the last 26 years, to work with hundreds of physician practices on a variety of projects. Most relegate marketing to an afterthought with duties as assigned to anyone in the practice who has extra time. Since that’s generally no one, not too much gets done. This isn’t meant as a put-down. It’s just what I’ve seen in places all throughout the United States, and if you talk about selling, you might really be in for an earful. As an example, one day I was talking with an eye surgeon client of mine who was getting started offering his patients an optional upgrade to the implant during cataract surgery that potentially reduced their dependence on glasses. In the conversation, I shared with him the results of some anecdotal research we did that resulted in a dramatic increase in patient acceptance of this upgrade option. After I said that, this man looked at me, and, in the kindest manner he could, said, “I didn’t go to medical school to become a salesman, Joel, and what you’ve just said there sounds like a salesman.” This was in the early days of patient-shared billing in ophthalmology, but, sadly, most physicians still fall into this camp. What’s also true, though, is that things are changing rapidly, and their patients are coming to see them with seeds of intent planted and looking for validation of the choices they’ve made based on friends, family or social recommendations. I’m not sure why some docs fight it, but they do. Another interesting story is regarding the LASIK market. If you look at the LASIK market and where patients come from, it’s pretty well accepted that most patients come from some sort of past relationship with the surgeon. 55 to 60 percent is the accepted market, meaning past patient referrals. When you have a conversation with a LASIK surgeon and talk about this data, it’s pretty well accepted, and they understand and believe and perhaps even agree with that statistic. The interesting thing is, when I ask them what they’re doing to keep in contact with past patients, most of the time it’s they’re not doing anything. There’s a bit of a disconnect there that a cognified marketing and selling approach can help with, specifically if they think about that there were millions of LASIK patients done or even refractive surgery patients done from the early 1990s up until now that there’s a whole segment of the population in those past patients who have had children who are now LASIK age who have grown up being able to witness their parents have the life-changing benefit of LASIK surgery. Yet the interesting thing, to me, is that not a lot of people have spent a lot of time trying to harvest that vein of past patients to grow their businesses. When it comes to physician marketing, mostly they’re getting poor results not because they can’t be good. Most don’t work at it, want to write a check for results and give up too soon when what they paid for doesn’t work. My team hears me say all the time that we’re selling gym memberships — paying your bill doesn’t get the job done. Exercising and controlling what you put in your mouth does. We tell our clients that, and it’s not what they want to hear, but it’s the truth. All this was made clear to me when we bootstrapped Sightpath Creative. Sightpath Creative is an internal agency that we created to help the clients of Sightpath Medical to grow their practices. From the start, we began searching for a simple approach to making marketing smarter, metrics driven and cost-effective. We believe the best way to accomplish this was with a campaign-based approach. We figured if we helped practices understand their markets, think of those as classes, develop ideal personas, think of those like attributes and create programs — methods — to yield desired outputs, we’d be delivering value to our clients. We were right and have now helped more than 50 of our clients grow their practices, reduce headaches associated with marketing and rest easier knowing they were using a smarter approach. From the start, we formed an agency who only works on ophthalmology. Essentially, we’re harnessing the power of focus, data, and agility, and, what do you know, it works. Why am I qualified to deliver a podcast like this and why now? This is the question three and four combo special. I’m not sure that I am. I do know that, like you, every day I get up, work my priorities, and look for ways to crack the code of success. Your particular endeavor may be quite different than mine, but still, I believe we’re all in this together and we can, dare I say must, learn from each other. What gives me the audacity to start something like a podcast? For starters, I don’t believe there is one like this that exists today. I aim to give it my all and deliver something of value that will help people and, as I mentioned earlier, get them to think, I’ve never thought of it like that or heard it put that way before. I’m resisting the urge to use the tired quote by Steve Jobs of, “Think differently.” I guess I just did. I’m not doing this alone. I’m doing this to serve others, and with some luck and work, I will stand on their shoulders to achieve anything with this initiative. I don’t purport to have all the answers, but I have demonstrated throughout a 26-year career in the field of medical device sales and marketing, ophthalmology specifically, the ability to grow a territory, product line, and enterprise. I believe I have accomplished all of this because of a fervent desire to serve, the ability to listen, and the disciple to take a step into the unknown. As an example of this, I had a long, curvy road owning a math game and activity development and publishing company for 12 years. What started out as a passive investment evolved into an enterprise that required me to draw upon pretty much every skill I had, personal and professional. I am grateful for the 12 years I spent growing this business because it was completely unrelated to my chosen field, and yet I believe it has helped me be a better ophthalmology marketing and selling professional because of what I learned. I recently sold this business and now count myself among the successful entrepreneurs who created something out of nothing and sold it. It was rewarding, exciting, heartbreaking, exhausting and all of the things that you read about. What’s also true is I loved every minute of it. My passion is, though, the field of ophthalmology. I am grateful for all it has provided for my family and me. To further credential myself to the listener, since the benchmark most of us use for success is dollars earned, I feel confident that my career earnings place me in the top one percent of lifetime earners for sales and marketing in the business side of ophthalmology. This isn’t bragging or giving away a secret. Regrettably, I was involved in some litigation a couple of years ago where all of my earnings were made public. This was a difficult time following a break from a person I was once very close to, and I’m grateful it’s over and I came out victorious — not without bumps and bruises but certainly wiser for the experience. If you’re interested, I wrote an article about this experience for “Success” magazine’s blog. You may find the article, “10 Things I Learned When I Was Knocked From My White Horse,” on success.com. Last I checked, the article was shared more than 28,000 times on Facebook from the blog, so the idea of getting knocked down, picking yourself up and persevering must resonate pretty well with people. In the days before I was going away to college at the University of Minnesota, I had a conversation with my dad about what I was thinking about majoring in when I got there. For the purpose of the backstory, my dad has a Ph.D. in mathematics education and had a career as a public-school superintendent. While we were talking, I mentioned a few different ideas, and my dad flatly said, “You may major in whatever you want to as long as it’s math or science.” Incredulously I replied, “Why’s that?” His response sticks with me to this day. My dad said, “Because math and science teach you how to think. You learn to form hypotheses, isolate variables and solve problems. All of these are skills you may apply to anything once you have built that solid foundation.” I graduated five years later with a bachelor of science in biochemistry, and I am forever grateful for his advice, even if it took me a victory lap year to figure it out. Like so many things in my life, the achievement of a degree in biochemistry was anything by linear. If you couple this with my mom, who was a nurse and obsessively reminded me to see what needs to be done, perhaps you can see why I am working on this project. To tie this back to the cognified term and demonstrate that my dad’s logic worked, here’s another example of something I learned in biochemistry that has found its way into my metaphoric liver after all these years. I’m astounded by the similarity of a need and product or service coming together at just the right time to yield the desired response. It’s the age-old marketing dilemma — how do I find someone who’s need is aligned with competencies of my service or product at just the right time, run the right ad, ask the right question, offer the perfect hook – those sort of marketing things. To me, this is a lot like the lock and key theory I learned in biochemistry. I know, this is super-geeky, but stay with me for a moment. First a bit of background in terminology. An enzyme is a protein that acts as a catalyst to initiate some mechanism of action. Floating around by itself, it can’t do much of anything. Once it finds a place with an acceptable binding site to land — this is called the substrate — the fun really starts to happen. In the lock and key theory, only the correctly sized key — the substrate — will fit into a keyhole and actuate the lock, the enzyme. As I said, this is a little geeky, but you get a sense for how my brain works and why I’m grateful for the seemingly strange boundaries my dad placed on my college major choices. If you decide to become a loyal listener, you’ll hear more about this analogy. You see this fits with what I’m interested in with cognified marketing and selling. Can we discover ways to help put the right key in the lock to accomplish our objectives? As Kevin Kelly wrote about, it’s not a huge iteration that drives change, it’s little bouts of getting smarter and thinking about how to do things better. Finally, I believe the confluence of technology, an aging population, the Internet as a neural network, and the human need for connection will all come together to create the next age, the cognified age. I’m starting this podcast now because I feel called to do it. I can’t say why. I simply have a burning desire to help others see what I’m seeing, and my nature is to give it a shot. My experience is that by serving others they will add to what I am thinking about and together we will all end up in a better place. That’s my own little version of utopia. Thanks for indulging me. Writing, producing, and editing this is a lot of work, a bit scary because I’ve never done anything like this before, but you never know. It might just work. All right. If you’ve gotten this far, please know I am grateful for the gift of your time and attention. If you believe you have something to say that may offer value to others, want to share a story that ends with you or someone you know winning or just having a rant about something interesting going on in the selling and marketing world, please connect with me. You can easily find me via Twitter, @JoelGaslin, on LinkedIn, or send me an email at [email protected] That’s J-O-E-L-G-A-S-L-I-N.com. We can get together for a discussion and/or an interview. Of course, please go to iTunes, leave a review of this podcast you believe is appropriate and sign up at cognifiedmarketing.com to be notified every time a new episode comes available. My plan is to publish weekly on Fridays. I’m working on my topic and guest list now, so please stay with me if I’m a little sporadic at first. The data says that people stop producing podcasts after they make their first five episodes. I guess this is because people don’t see an immediate revenue stream from their medium and that gets frustrating.